Landscape Use: Flowering accent, mesic shade tree, pan-tropic as a landscape tree. Tipu tree is classified as an invasive species in south Africa and is a widely planted street tree in tropical cities. Form & Character: Evergreen to partially deciduous, upright and broadly spreading with age, open umbrella-like canopy. 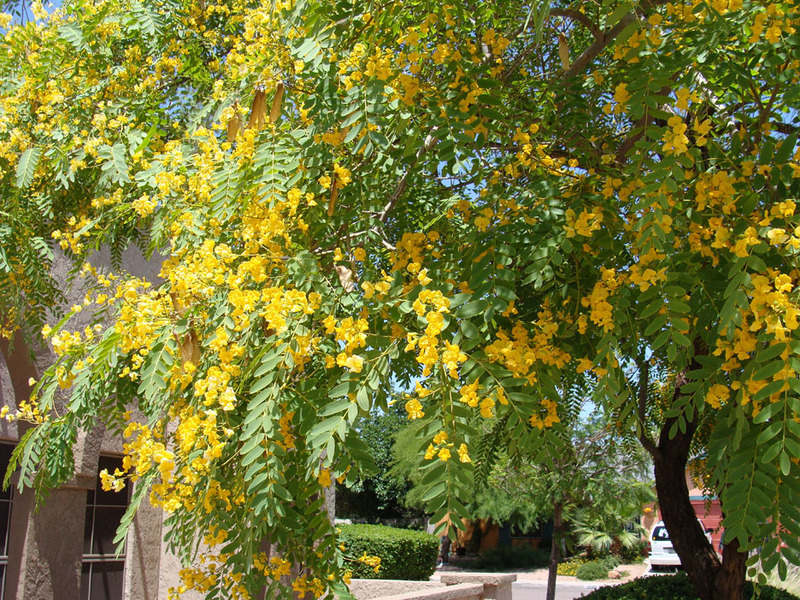 Growth Habit: In Phoenix this is a generally flat topped tree to 35 feet, but can eventually reach 50 feet with lesser or equal spread. Trunk and branches have a roughened bark. This tree is much larger when grown in coastal Southern California than in Arizona deserts. Foliage/Texture: Odd pinnately compound leaves (number of leaflets, not that they look weird), 11 to 21 oblong leaflets, light green in color; medium texture. Flowers & Fruits: Yellow to apricot pea shaped flowers, fruit is a samara-like, 1 to 3 seeded winged pod. Temperature: Hardy to 25oF and shows summer heat stress when grown around built surfaces of concrete and asphalt. 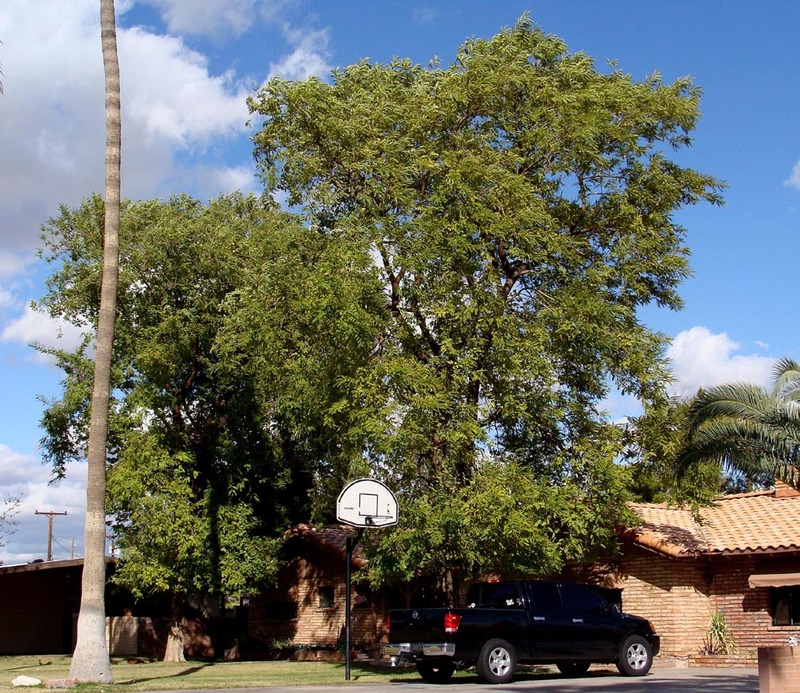 Young trees are damaged by freezing temperatures during Phoenix winters, especially in southeast and western reaches of the Phoenix metro area. Soil: Some intervenal chlorosis might occur in alkaline central Arizona soils. Watering: Tipu tree needs ample regular supplemental water in Phoenix to grow a lush dense canopy and not suffer heat damage during summer. In more moderate locations such as southern California coastal regions, tipu tree is considered fairly drought tolerant. Pruning: Elevate canopy base high into inverted vase canopy. Tipu tree tends to form low co-dominant stems that if left unpruned might form bark inclusions resulting in catastrophic limb failure. As a result, significant training for strong branch attachments should be considered as a normal part of this tree's regular maintenance especially after transplanting young specimens into the landscape. 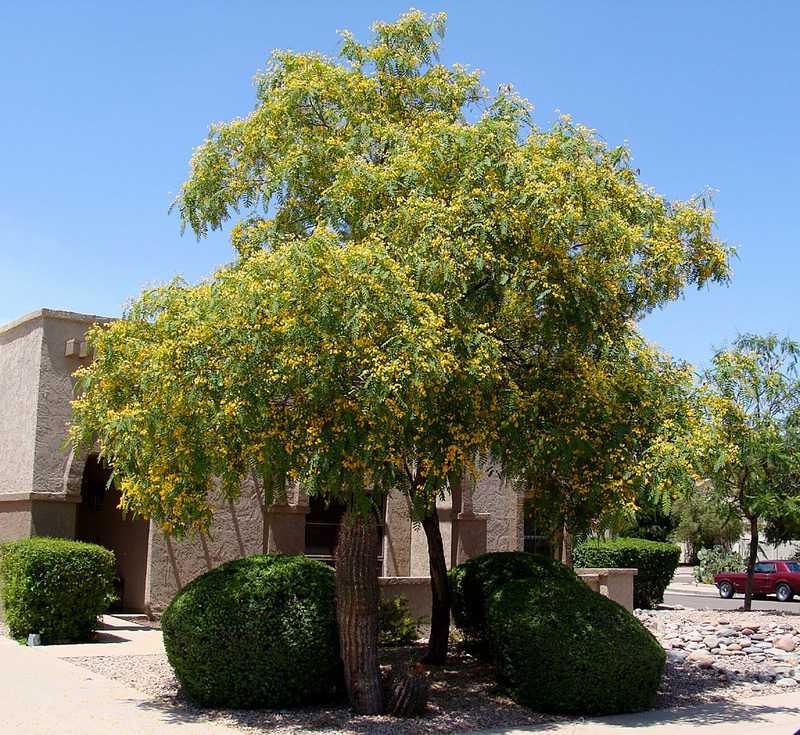 Additional comments: In Phoenix, tipu tree is a beautifully ornamental mesic (locally needs a good deal of supplemental water) shade tree of comparatively reduced vigor compared to its habit in coastal southern California where it can become massive in size. Note this tree can seasonally produce copious foliage, flower and fruit litter.